ESPECIALLY if you live in Phoenix Council District 3 (Councilman Gates) or use the Cave Creek wash trails. Bicycle projects get done when bicyclists show up and support. (email addresses for Phoenix officials are below). In April of this year, several of us from the bicycling advocacy community attended a meeting in Phoenix District 3, hosted by Councilman Bill Gates, during which community input was gathered by Gates relative to this project. The project has been previously approved and funding allocated, and it is part of both the regional bike plan and the Gold Circle Trail plan. We spoke to the reasons why we believe the project should go forward, which included the points put in letter form to Joseph Perez (copy below), as well as other expected benefits such as commuter safety, health benefits of recreational users and expected increased property values (based on studies of other pathway/greenway-adjacent areas around the country). 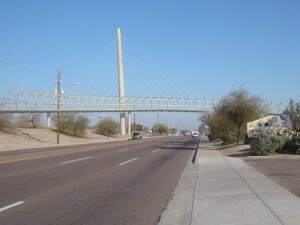 As there was some vocal non-cycling local resident opposition to spending the funds to complete the project and connect the Cave Creek Wash path, which would then run from the AZ Canal path to Union Hills (where there are bike lanes), Councilman Gates has managed to put this project on hold. The project is significantly funded by federal and arts sources, so this is utilizing funds that AZ cyclists have paid in taxes to the federal government, along with local funding. If we don’t complete the project, those funds go back to our government to be used elsewhere ( Phoenix has no guarantee or claim on the money for an alternative project). This project is sorely needed in order to safely connect a significant alternative mode transportation corridor which is part of the Phoenix Bikeway System. Currently, the Cave Creek Wash path is interrupted at this point for over 1/3 mile. This project is greatly preferred to an at-grade crossing of 19th Avenue , due to safety benefits that it will provide to bicyclists and pedestrians, and is preferred to a below-grade crossing because a below-grade option is subject to flooding and lack of visibility creates more of a personal safety concern. This project will benefit motorists as well as alternative mode users, as construction of an above-grade bridge means that all users can cross this point without interruption. An alternative such as a HAWK crossing on such a busy arterial would cause frequent stoppages of vehicular traffic, and would likely increase frictions between motorists and bicyclists. That is something the bicycling community would like to avoid. A good portion of this project has been funded with Federal assistance. We believe that our community deserves our “fair share” of such funding, and the bicycling/alternative mode transportation community expects to be included in transportation enhancements (on a relatively very small scale) along with motorists. This project has been planned and approved since 2006. We believe it is essential to complete the project and not discard the planning, time and federal funding that the community has invested. Thank you for the opportunity to register our support for this project! 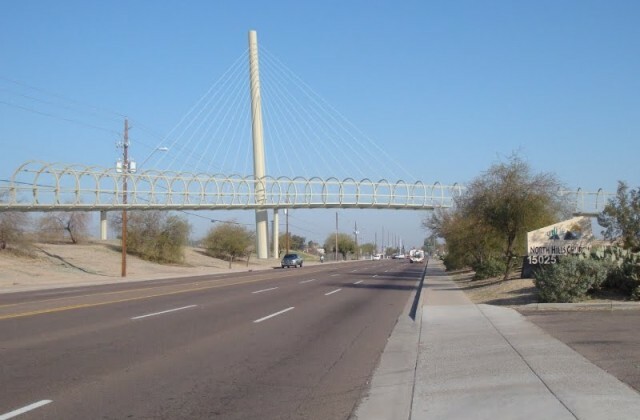 Story about the project in the Arizona Republic Advocate fears loss of funding for N. Phoenix pedestrian bridge. Strangely, there is nothing in this story about the bridge being needed to provide continuity for the trail/bikeway. Please visit the following this site for more detailed information related to the bridge project. This project is greatly preferred to an at-grade crossing of 19th Avenue, due to safety benefits that it will provide to bicyclists and pedestrians, and is preferred to a below-grade crossing because a below-grade option is subject to flooding and lack of visibility creates more of a personal safety concern. What happened at the meeting? What were the comments pro/con? Why are residents opposed to this bridge?